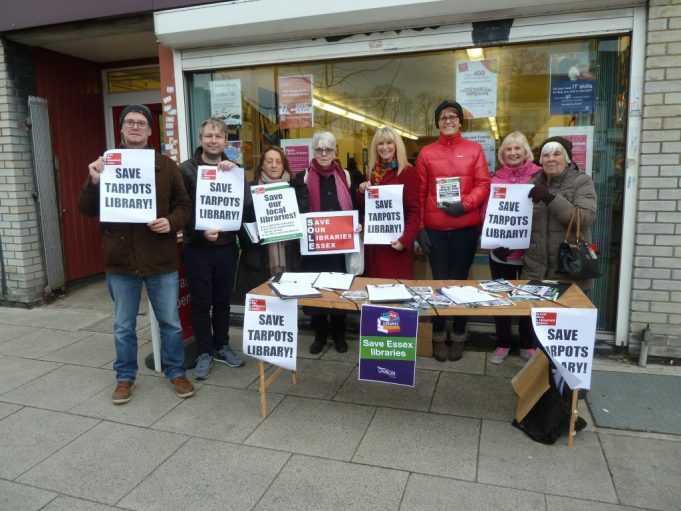 On Saturday 12th January 2019 a group of volunteers mounted a petition signing session to highlight the potential closure of Tarpots Library. These volunteers largely did not know each other and had come together due to a request for help on the Save Our Libraries Essex Facebook page. They worked from 11 am to 1 pm and collected around 170 signatures in that time. The ECC consultation has now closed and is being evaluated by the Essex County Council. They expect to make a decision after the 18th June. A thank you to everybody who completed the survey and signed the petitions. Essex Libraries are consulting about revising the Library Service in Essex. Under the proposals the three libraries in mainland Castle Point are all designated Tier 3. This means that the County Library service will eventually cease in Benfleet, Hadleigh, and Tarpots within 12 months or so unless volunteers can be found to raise money to fund new premises and run the services themselves. It has been made clear by the ECC that all three buildings used by the current libraries will not be available and that these will go into the ECC property pool for redevelopment. Any Community Libraries will need to find and pay for a completely new set of properties.